Quickly layout books, newsletters, pamplets, manuals and other desktop publishing tasks. Learn more about Page Layout! 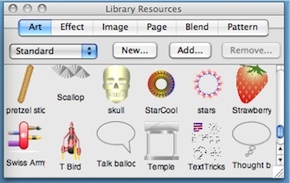 Splines, Stars & the Library let you quickly make and reuse art. Make logos, business cards, flyers, announcements. Now, anyone can publish a web site! With true WYSIWYG, layout your site just the way you’d layout a page! This site is made in Create. Learn more about Web Authoring! Create’s unique Library of Art, Effects, Blends, Patterns,Pages and Images - add custom palettes! Create is 100% AppleScriptable and Automatable. No need to replicate items with Master Layers - great for Nav Bars & book making - change an item in one place to affect whole document.